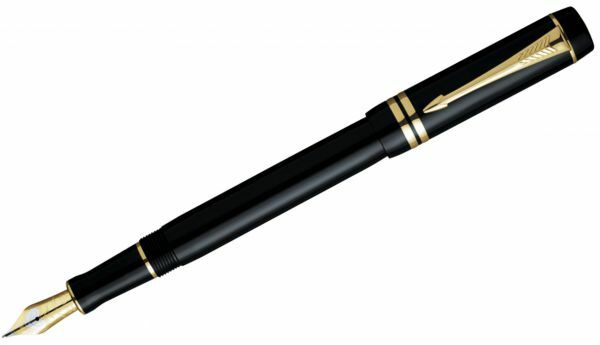 Parker Duofold International Fountain Pen, Medium Point, Black With Gold Trim-18k Solid Gold Nib. Since 1921 Duofold has been the icon of PARKER’s stunning craftsmanship and heritage. Finished in precious resin, Duofold provides an exceptionally comfortable and luxurious writing experience thanks to its solid 18Kngold nib. DUOFOLD – the reference in fountain pens. Crafted from solid, velvet black cast acrylic with highly distinguished contrasting golden finish trims. Parker Duofold is finished by hand and precision-crafted from a solid block of hand-cast acrylic. and manually assembled to provide the ultimate in writing comfort and high-precision lines.